A friend of mine posted this on her blog. Perfect reading for New Year’s Eve if you want to be inspired to continue to walk with God. If God has called you to be really like Jesus He will draw you into a life of crucifixion and humility and put upon you such demands of obedience that you will not be able to follow other people, or measure yourself by other Christians, and in many ways He will seem to let other people do things which He will not let you do. Other Christians and ministers who seem very religious and useful, may push themselves, pull wires, and work schemes to carry out their plans but you cannot do it; and if you attempt it, you will meet with such failure and rebuke, from the Lord as to make you sorely penitent. The sheep are those who are true believers; possessers, not just professors, of Jesus Christ and His death and resurrection as their only way of salvation. 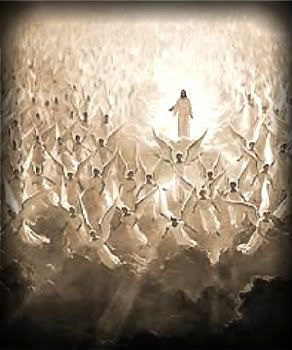 They will be invited to enter into their inheritance in the Kingdom of Heaven that has been prepared for them. The next several verses are some of the most beautiful and meaningful in describing what our walk with Jesus Christ should be. I think they will be a great way to start our new year together. Jesus will sit on His throne of glory. The angels will be visibly present at this great judgment of the people of all nations.The church is not mentioned here in Matthew. We know from other passages that He will bring His own with Him, and they will take part in the judgment as well as in the government of the earth and the universe (I Cor. 6:2). The angels will have specific work to do (Matt. 13:41-42). The question here, then, is who exactly will be judged. The Lord says all nations. It would seem clear, then, that this judgment is of all people of all nations who are living in the day when Jesus appears in His glory at the second coming. This judgment, then, has to exclude the church, which was raptured away before the terrible events of the Tribulation period. This is not the judgment seat of Christ, in which all true believers must appear either for approval or disapproval. This judgment has already taken place before the events of the Second Coming and the judgment of the nations from the throne of the Son of Man. Israel plays a huge part in this judgment. Jews who have endured through the Great Tribulation will have received His as Redeemer, King, Messiah. But there will be other nations on the earth who have not all turned to Christ. True believers are the sheep; unbelievers are the goats. The place of this judgment is undoubtedly Israel. Zechariah 14:1-5 and Joel 3 talk about this judgment scene. Those who are to be judged will not be the church, or believing Israel, but all other nations who are alive at the time of the Second Coming. There is no art that can do justice to this scene. We don’t know what it will look like. We only know that when He comes, there will no longer be any doubt in anyone’s mind or heart about Who He is. This scene is closely connected with Matthew 24:30-31. It takes place after His visible and glorious appearing as Son of Man, and after His elect (the remnant of His eartly people, all Israel), have been gathered. We have, then, in chapter 24:3-41 and chapter 25:31-46 the chronological events that will occur at the end of the Jewish age and the judgment which will take place immediately after He returns. I absolutely love this old lady. I’ve posted this video before, and it tickles me every single time. And what I like about the little old guy in the picture? Look at his right foot. He’s still moving! That’s how I want it to be! So, to get serious. Debility is the physical weakness, loss of muscle, softness, that comes with serious illness or old age, or both. Arthritis creates debility. So do any number of other conditions that can creep up on us while we’re not looking. It is upsetting when you need to ask for help in doing what used to be simple tasks. Opening jars, lifting things down from a cupboard, even passing a heavy dish along to the person next to you at dinner, can all become tasks that you never used to think about and now you can barely accomplish without a helping hand. No one ever wants to be helpless. My husband is by no means helpless, but it bugs him to death that he is no longer the strong pillar of support for me that he used to be. Losing strength is losing independence. I was born on Independence Day. It probably should have been my middle name. I value my independence perhaps too much, never wanting anyone to do for me what I feel I should be able to do myself. The day is coming, and I know that it is, when I’m going to have to learn to graciously accept that helping hand, and to be thankful for it. There are, however, things we can all do to delay the onset of old-age debility, and to slow down the progress of it. Exercise. Yes, I know, you were dreading that word. However, it is the prime factor is delaying and decreasing debility. Exercise helps keep your bones strong, your muscles toned, and your agility in its best possible shape. It even helps to improve balance, which is a problem for many older folks. I believe that the statistics are that one in every three older people will fall in a 24-hour period. You don’t have to be a body builder. Walking is your first, best choice for exercise. If you hold low-weight dumbells while you walk, that’s even better. Weather is bad? Walk inside. There are walking videos especially for improving age-related debility. It will increase your back strenght, abdomen tone, and arms and legs. And it’s pretty painless. Water exercise is fabulous if you can find a place that offers it. Most YMCA’s offer water aerobics for seniors. It’s great for arthritic people because it takes the weight off the sore joints, and most of all it gets you moving. What you eat is important. Bone loss contributes to debility, so talk with your doctor or a nutritionist about how to keep calcium in your bones. You need protein, carbs, and fats for energy, strength and over-all health. Because there are so many of us in this Baby Boomer age category, the study and practice of geriatric medicine is booming. There is lots of good information online, at your doctor’s office, at the library. There are senior citizen centers in most communities that provide some activity, including dancing, that will help you get moving. There are walking clubs, and yoga centers, and classes especially for those trying to either maintain or regain some strength. If you are in generally good health but are starting to see weakness setting in, you have no reason whatsoever to just allow debility to overtake you. I know two women who are in their early 90’s. They are both still active. The get up every day, get dressed, go out and do things. One is still driving! They reach out to others and stay as busy and involved as they can. They are happy by nature, and they are a joy to be around. So much of our enjoyment of life as we age centers on our own attitudes. I want my grandchildren to enjoy seeing me coming. I don’t want them to sigh, knowing they will hear nothing but a litany of complaints about my aching this and hurting that. I want to be a part of their lives that they will remember with pleasure, not a sick old woman who casts a pall of blah over everything all the time. Aging is inevitable. Misery is not. Take steps to be the best that you can be, as long as you can. This is possibly my most-loved Christmas song. I think it captures the awe, the wonder, the holiness of the birth of Jesus Christ for all who were involved, from angels to shepherds, wise men to Mary and Joseph. I’m posting it tonight as my Christmas gift to you. Merry Christmas, and may God bless you as you remember His most wonderful gift to us.